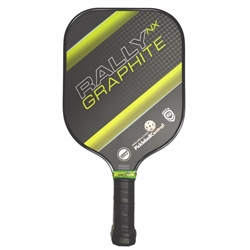 The Rally NX Graphite is Pickleball Central's return to the popular Nomex core used in the very first version of the Rally. This paddle offers excellent "pop" thanks to the hardy core, and paired with the graphite face, you'll experience a notable increase in speed. The practical dimensions make this a good fit for players who want a reasonable amount of surface area and a practical grip size. 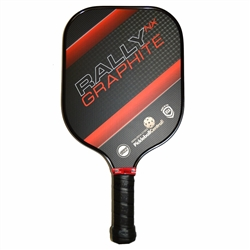 The Rally NX Graphite is appropriate for players of all skill levels and weighs in at an average of 7.4 oz, making it a middle weight paddle. The sizable 8-1/8" wide face offers a large sweet spot. 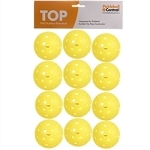 The grip has a small circumference so that it will fit any player while accommodating an overgrip for increased cushioning as needed. 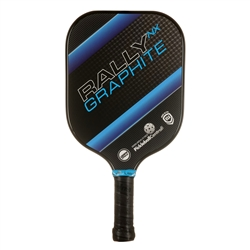 A black background offsets the paddle's name running diagonally along the paddle's face.